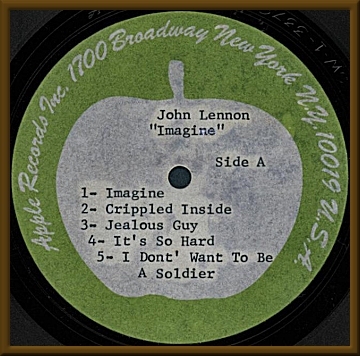 “Imagine” is John Lennon’s classic album and here is a highly unusual version of it. 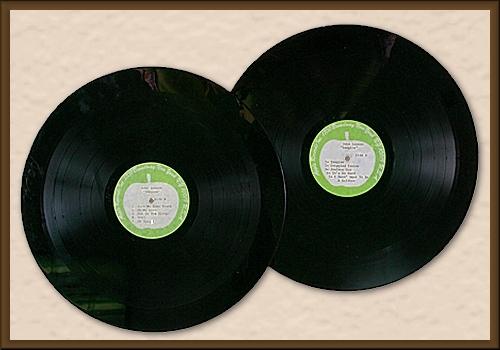 This is a set of two one-sided metal acetates of the album which have Apple Records (New York) labels. Apple acetates themselves are highly collectable, but what makes this set odd is that the acetates are not 12 inches in diameter, they are 14 inches! Also unusual is that they actually have the matrix numbers of the released LP scribed in the trail-off area, along with a Bell Sound logo. Most acetates do not have any trail-off markings. Largely scribed around the outer perimeter on each acetate are the words “Apple (for Capitol)”. A sensational Lennon artifact!! Discs VG. Auctioned again in April 2005 by Goldberg Auctioneers. Item location: Beverly Hills, CA. (The Beatles) John Lennon's "Imagine". An unusual version of John Lennon's 1971 classic album. 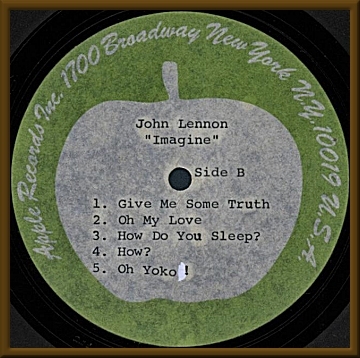 This is a set of two one-sided metal acetates of the album which have Apple Records (New York) labels. Apple acetates themselves are highly collectable, but what makes this set odd is that the acetates are not 12 inches in diameter; they are 14 inches! Also unusual is that they actually have the matrix numbers of the released LP scribed in the trail-off area, along with a Bell Sound logo. Most acetates do not have any trail-off markings. Largely scribed around the outer perimeter on each acetate are the words "Apple (for Capitol)." A sensational Lennon artifact!